Our mini-guide to France’s city of film, culture and creativity. Your time starts…NOW! 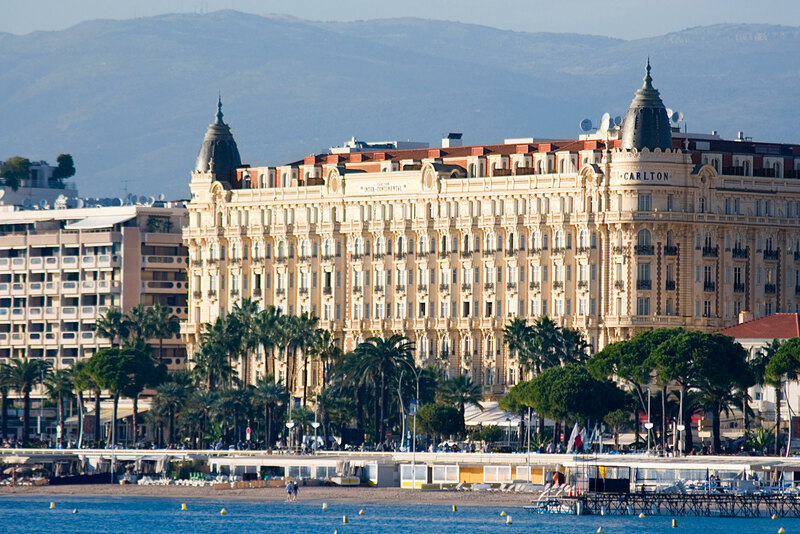 This shining white confection of a hotel on the Croisette is an icon of the jet set, where cinema royalty and real royalty have laid their head for over a hundred years. Built in 1911, the interiors are suitably grand with lots of lovely period features throughout, while the rooms are light and generous with French doors opening onto views of the Mediterranean. Many of the suites are named for the famous directors and actors who have frequented the world-famous film festival that takes place here every May. While the Croisette is an endless strip of luxury labels – Chanel, Dior, Dolce & Gabbana, Rolex, Louis Vuitton, Giorgio Armani (which has its own ‘must-be-seen-here outdoor café), Hermès et al – rue d’Antibes, a few streets removed from the beachfront, is a little more accessible to mere mortals. There are lots of familiar French names like Ladurée and Zadig & Voltaire, and some unique propositions like Nao Do Brasil, which is lined wall-to-wall with brightly coloured Brazilian runners. Restaurateur Jean-Paul Battaglia’s relatively new arrival on the Cannes food scene has made quite a name for itself with its menu of solid nouveau bistro dishes that change according to seasonal availability, hustled to table through the stylish, cosy dining room by an efficient and friendly staff. If there is a soufflé on the dessert menu, you have to order it: you can watch it go into the oven through the wide picture window into the open kitchen and then come out again a few minutes later all tall and puffy and delicious. Take your time and simply stroll through this medieval quarter; a magnificent contrast to the glitz of the Croisette.